Philips recently released a unique slimstyle LED light bulb, it’s flat unlike any light bulb we’ve seen before. This slimstyle LED light bulb was not created for style or aesthetics. The design actually allows development of inexpensive energy-efficient light bulb, with a more appealing indoor light than ordinary LEDs. Why they need to redesign the bulb? LED light bulb significantly cuts down energy consumption compared to incandescent bulbs, and it can also last up to 20 times longer. But LED struggles to attract consumers, One reason is ambiance: unlike incandescent bulbs, which emit a warm, flattering glow, LEDs tended to shine an unforgiving blue-tinted light. A second problem is price: incandescents can cost less than a buck each, while LED bulbs can cost around $20 a pop. 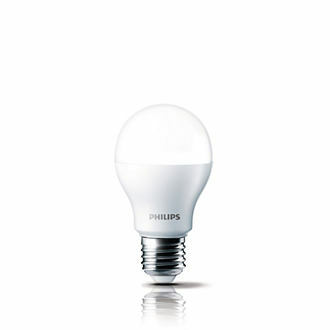 One of the reasons for the extra cost is a heavy (and expensive) metal heat sink that Philips (and competitors Cree and GE) include on the bulb’s base – as explained in fastcodesign. With the flat or pancake shape, LEDs are oriented in horseshoe – eliminating the need for heat sink, and radiating heat across the surface of the bulb arc producing somewhat the same ambiance as incandescent bulbs. LEDs are the future in lighting, it may just take a while for consumers consider or maybe it is just waiting for some additional innovation to finally rule the lighting industry. The SlimStyle light bulb is currently priced at $9.97 (~₱445.11 PHP) each. If you think it is expensive, try considering it as an investment, it pays you back in the long run in terms of energy bills, remember it can last up to 20 times more than incandescent bulbs.